The end of the Long March carried the cruel illusion that the hardship was finished, when really there were still 36 hours left in the race. Sure, there was only one more short stage — an easy, mostly flat 13 kilometers across Pokhara. But not until Saturday. Friday was technically still part of the Long March. For those of us who finished the 45 miles on Thursday, it was a rest day. 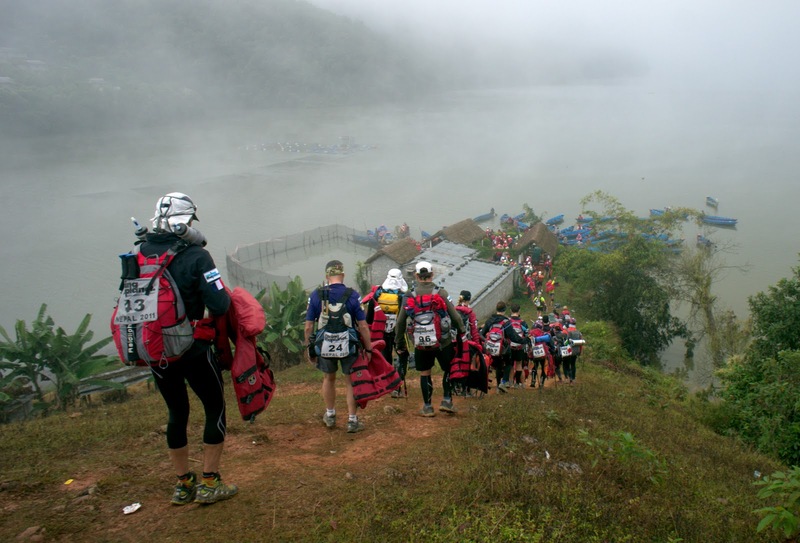 For me, it felt like one of the biggest endurance challenges of the race. I woke up feeling sick to my stomach. This was most likely my fault for running for sixteen and a half hours on minimal nutrition, but I blamed "the bug ... or a new bug." I shuffled miserably around camp and refused to eat. I sorted out the rest of my freeze-dried meals that I hadn't yet given away or thrown away and threw them away (and yes, the only freeze-dried meal of my own that I actually ate in seven days was the demon Thai Chicken before the race even began.) Our camp was located near the shoreline of Bengas Lake, a popular tourism spot, so we were surrounded by small restaurants. Beat coaxed me up to what was a common sight in the cities of Nepal — a single-counter store with various chips, cookies, ramen and soda. We shared a small bag of "American Sour Cream and Onion" potato chips and a Sprite. Very soon afterward, digestive distress ensued. I rushed to the toilets, and then returned to the tent to marinate in my own misery. As the sun rose over the hillside, the temperature inside the nylon oven climbed to what must have been 130 degrees. I lay in my sweat-drenched underwear on top of a Ridge Rest and moaned. A few times, Beat came to the door of the tent to coax me out. "It's too hot in here. Come outside." And then, twenty minutes later: "You need to get up and eat something." And then, another twenty minutes later. "Seriously. You have to get out of here." "Just give me twenty more minutes." "No, you have to eat something now. You ran for sixteen hours yesterday and you need something to recover. Seriously, this is how kidney failure happens to people." I crawled out of the tent and was almost surprised to discover that it wasn't 130 degrees outside. I added hot water to a cup of ramen and began working on it at a rate of about a spoonful per minute. 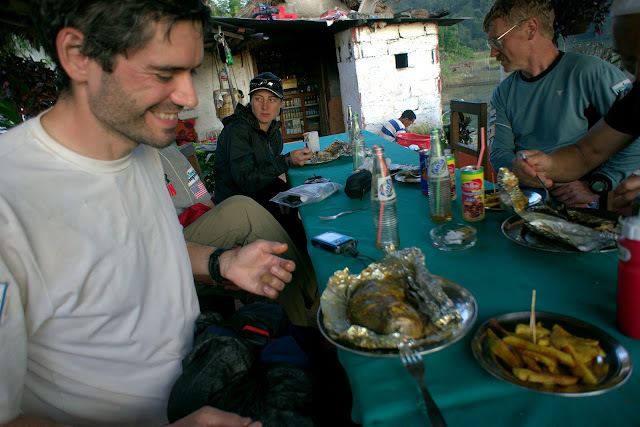 Steve approached and began raving about the most amazing grilled fish he just had for lunch, at a little restaurant down by the water. "The guy catches fish in a net, and then he cleans the fish, and then he fills it with all this garlic, chili and spices, and then he throws it on the grill, all right in front of you. It's awesome." Fish and garlic? It sounded awful to me, but I couldn't go back to the tent to lay down without stewing in my own brain proteins. I had to find some way to kill the daylight hours. Eventually I agreed to head down to the restaurant to sit at a table and drink soda, especially after Beat threatened to make me eat the Kathmandu Curry (he ended up eating it himself for lunch.) The lakeside restaurant was tiny, with a family of four taking orders, chopping potatoes, selling sodas and grilling fish on a barbecue barely large enough to hold two foil-wrapped fish. I ordered a small plate of fries and Sprite, and Beat ordered the fish. I agreed to try it, and then I ended up eating half of it. It was pretty fantastic ... more proof that I just had over-sensitive endurance stomach and not an actual illness. Although I would have benefited more from downing a couple thousand calories in electrolyte and protein recovery drink, the fish did me a world of good. But mostly, I was looking forward to running again. 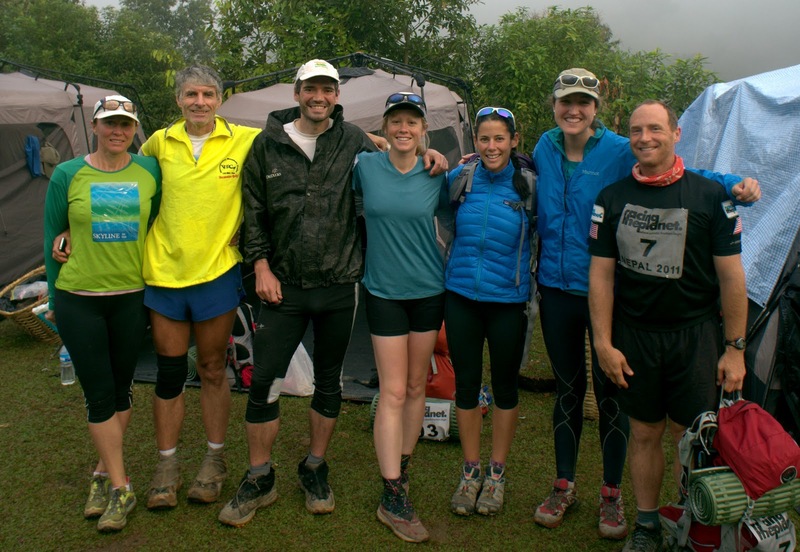 An ongoing theme throughout my Racing the Planet Nepal experience was that I generally felt okay on the trail, and horrible in camp. There are several factors that contributed to this, but I think in general I just cope better when I stay on the move. 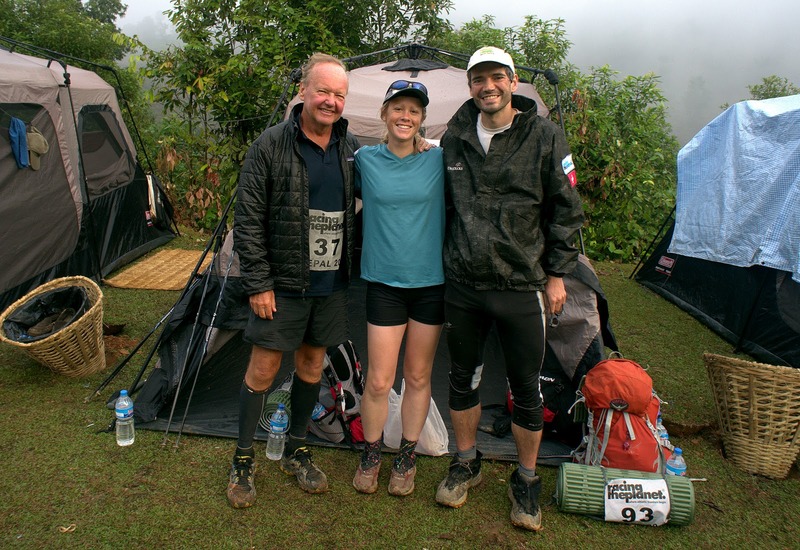 By the final night, only three remained in our tent out of the original seven: me, Beat and a retired British investment banker who lives in Hong Kong, Peter Clarke. Patty unfortunately became overwhelmed by her illness and had to drop out during stage five. We didn't see her again. Peter, who is 61 years old, not only managed to remain healthy through the sick-fest, but also finished well ahead of us in every stage but the last one. This is the contingent from the San Francisco Bay area: Martina Koldewey, Chuck Wilson, Beat, me, Sarah Diaz, Erin Sprague and Steve Ansell. Stage six was 13 kilometers (8 miles) with 130 meters (426 feet) of climbing. Short and flat. 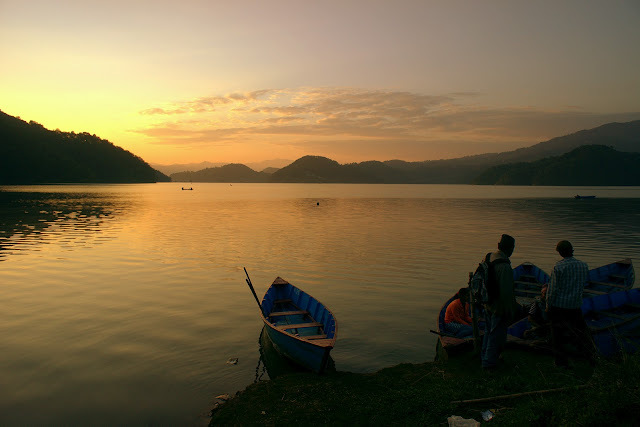 Before we could start running toward Pokhara, we had to get to the other side of Bengas Lake. Racing the Planet set up an elaborate shuttle system using dozens of small paddle boats, each with its own local captain. Beat and I thought it would have been more fun if racers were each issued a paddle and given the task of paddling the boat as part of the race, cooperation style. Or better yet, have the leaders swim while towing the back-of-packers in boats behind them. Our particular captain was a bit competitive himself (and probably younger than 18, although child labor is commonplace here; the median age in Nepal is 20 and 40 percent of the population is younger than 14.) Even though our boat started near the back, we passed enough boats to get a good spot on the starting line. For breakfast I ate my last bar, a Nature Valley Peanut Butter Granola Bar, savoring every bite. And that was that. There were no more bars. The run into the finish was mostly uneventful. We actually did run at about a 10-minute-mile pace until we hit an open swamp, where the footing became dicey and I also experienced a serious bonk. Of course my entire race experience was essentially one big, drawn-out bonk. But this one had a sharper feel, a touch of finality, and I nearly panicked. "Holy cow, I'm going to shut down right here like that woman who collapsed just a few meters shy of the finish line in the Boston Marathon." 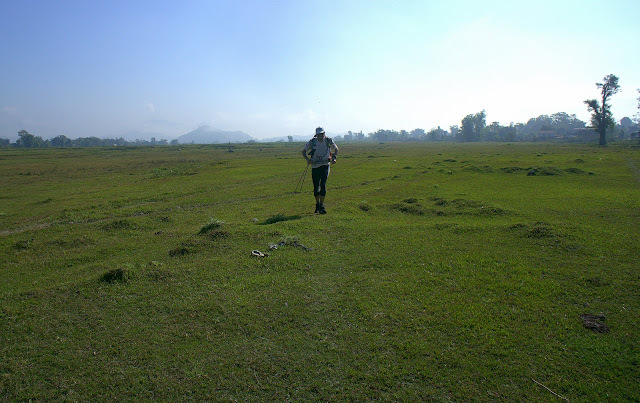 We were still five kilometers from the Fulbari Resort. I sputtered to such a crawl that Beat asked me what was wrong, and I admitted I was out of gas. Luckily, he had one more energy bar and relented to splitting it with me. With those final sparks of fuel, my distress subsided. I looked up and for the first time that morning, actually noticed the incredible skyline spread out before us. The many photos in these posts don't even come close to depicting the scale of these mountains, and as a visual it's impossible to describe. 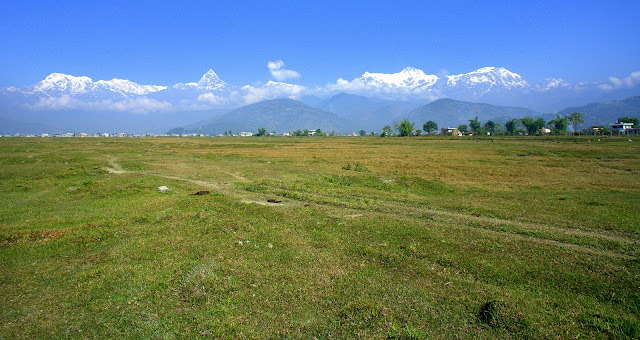 Pokhara Valley rests at 3,000 feet. Less than twenty miles in a direct line, the elevation rises sharply to 25,000 feet. 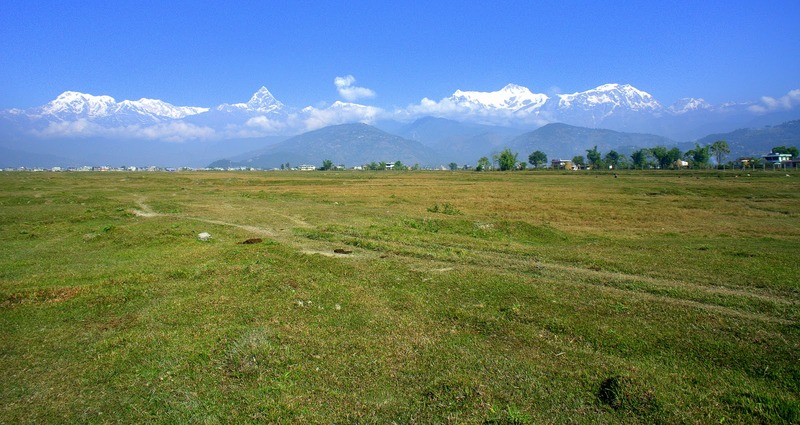 The skyline features three eight-thousanders (as in meters): Dhaulagiri, Annapurna and Manaslu. The photogenic pyramid in the middle of the Annapurna range is the 7,000-meter Machhapuchhre ("Fishtail.") I like to believe that someday I will return to Nepal and trek into the heart of these mountains. But even to see them from afar is consistently breathtaking. After a surprisingly short hour and 45 minutes, we strode across the finish line to a barrage of clapping schoolchildren, Nepali ethnic music and a holy man dabbing blessings on our forehead. We received a medal and shawl as we bee-lined for the pizza — pizza! —which is all I was capable of thinking about in that moment. 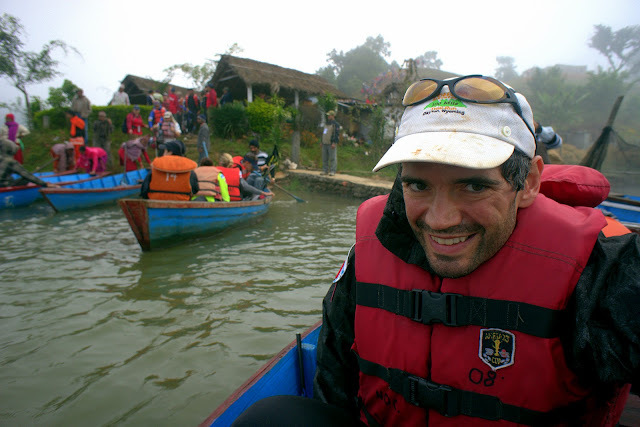 But beyond all the small details of the race was the simple yet deep satisfaction of having completed one of the toughest — and yet most culturally and personally enriching — journeys of my life. In time I would reflect on the thresholds I had crossed, but for now it was time to simply celebrate and bask in the warm sunlight. We hugged new friends and toasted glass bottles of soda and beer to a race well run. I hoped in time my body would forgive me for the relentless struggle through weakness in pain. Pizza was a good place to start. A fantastic race and great writing Jill! Loved reading the posts from your journey. A once-in-a-lifetime adventure! Thanks for letting us tag along. Don't know how you folks presevered through this amazing adventure. Great writing. What an inspiration! Rock on! It sounds like an amazing experience, in spite of the illness. keep on sucking the marrow out of life, god speed Jill Horner. Great story, great pictures!! Definitely a sufferfest. 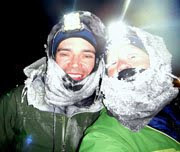 Hey, I see you and Beat are doing the White Mountains 100. If you guys need a place to stay before or after the race, you are welcome to stay with us. We have an extra room/bed and are used to gear and sweaty clothes strewn all over the house. Awesome experience. Definitely qualifies as "Epic!" You guys are quite a pair. I think it's awesome. Another great write up Jill! Loved reading about the race and the area. Inspiring as always Jill. Been reading from the beginning years ago and look forward to every new adventure. Corrine, thanks for the offer. We may take you up on it as the time gets closer. I'll stay in touch. Alex, After a taste of the (huge stone step) trails on the Circuit, I have to admit I'm more than a little intimidated by the idea of bikepacking. However, I did purchase a map in Pokhara, created by a crazy Italian guy, that lists the percentage of "bike riding," "bike pushing," and "bike carrying" for each section. It also makes a case for biking still being a faster mode of travel than trekking, but I'm dubious about that as well. There was a lot of bike carrying listed in that map alone, and I'm guessing that guy is crazier than I am. So glad the weather the weather reversed it's behaviour in time for the race. Such spectacular scenery captured by your lense. 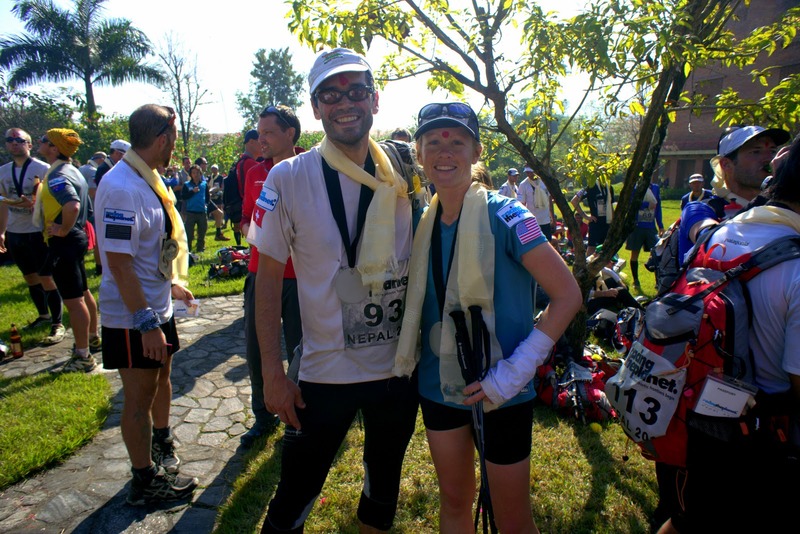 How you both kept going is beyond belief! Sincerely hope you're soon feeling 100% again. Congratulations on finishing that beast, and thanks for using your writing talent to once again share your incredible experiences with us. Congratulations on finishing. You were sounding a bit worse for wear the other day, with the puking, and the 5000 steps, but I knew you were in good shape when you ended your post with some fanta and french fries.